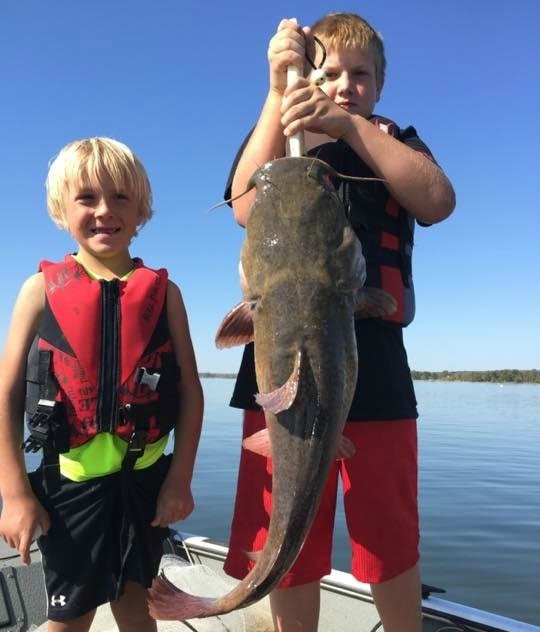 Rusty Pritchard is back with another Grand Lake fishing report for Sunday, October 18, 2015. Well the white bass and hybrid fishing is great right now – we have been catching some great size white bass and even some nice hybrids this past week. We have been trolling windy points with 2″ Go Go Minnows on 1/4 ounce heads. We’ve been trolling up in 2′-3′ of water running around 3 mph. The hybrids have been out in deeper water but we’ve been catching them on the same rigs! Catfish have been hit and miss. If we have wind the fishing is pretty good. I had a 10 year old kid catch a really nice flathead drifting last Thursday on cut shad. We’ve been drifting out in 25′ of water to do the best. Crappie are still on the bite in 10′ of water. We’ve even been catching a few really shallow on the windy points. Heard a great report of some people really catching a bunch off the Bernice bridge! Spoonbill fishing is right around the corner! If your looking for a weekend date you might want to get with me soon as these dates fill up quick! If your looking for a guided trip give me a call at 918-964-0174 and also check out my website at www.rustypritchardoutdoors.com. Also if your on Facebook give me a friend request under Rusty Pritchard and keep up with the action daily! !